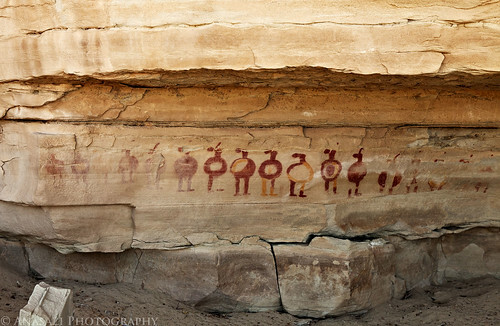 Here’s a wide view that shows most of the pictographs that are part of the ‘Quail Panel’ I guess this panel was called that because the figures kind of look like quail? Whatever the reason for the name, I can tell you that this is a very cool panel of small pictographs. The figures here are approximately six inches in height. I don’t think I’ve seen a lineup of this many Fremont shield figures anywhere else before, and especially not painted in red and yellow. It’s interesting to note that each figure painted here appears to be different from all the others and that no two are exactly the same.